In my previous post about visiting Shanghai Prairie in Ann Arbor, Michigan, I discussed the background of the restored priaire and showed you some of what's growing there, including grasses and some fall-blooming flowers. I didn't have the chance to show you everything, so here are some more photos from my visit on September 12, plus tips for how to incorporate these native plants into your own garden. The prairie has subtle undulating elevations, due to the area previously being strip-mined. This means both plants that prefer wet soil (lower areas) and plants requiring very dry soil (higher areas) grow there. Gray or old-field goldenrod (Solidago nemoralis) has green-gray fuzzy leaves and likes dry or well-drained soils. It doesn't mind clay soil, does well on slopes, and gets about two and a half feet tall. 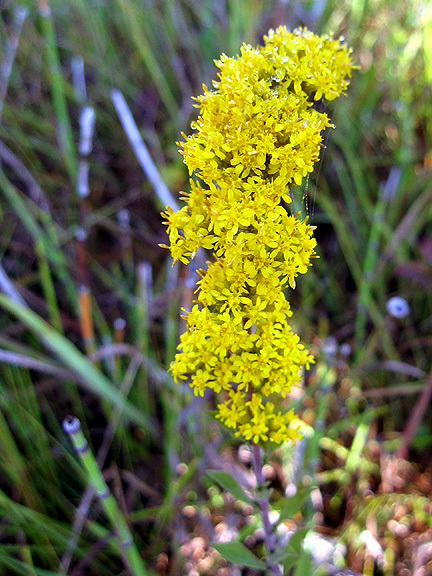 Stiff or stiff-leaved goldenrod (Oligoneuron rigidum, formerly known as Solidago rigida) can get up to 5 feet tall. It prefers full sun and dry soil. 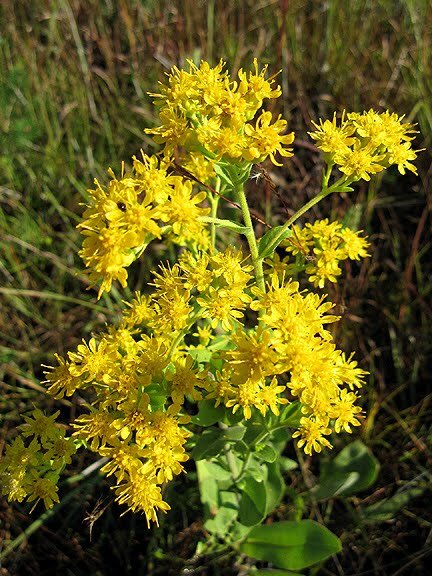 The foliage is pale green with thick leaves extending perpendicular to the stem, and the flowers are a bit more showy than other goldenrods with more of a poofy shape than upright stalks. Great blue lobelia (Lobelia siphilitica) prefers moist or wet soil and part sun. It can handle full sun if it's in extremely wet soil. It can reach 3 feet and attracts bumble bees. I like its blue flowers in the late season when most other blooms are yellow, pink, or white (in my garden, anyway). Alas, my soil is not wet enough to grow it, but if you have a bog or wetland, or are simply willing to water frequently, give it a try. 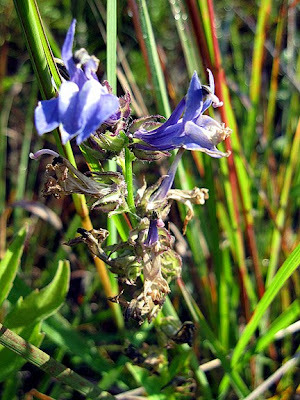 Great blue lobelia is endangered in Massachusetts. 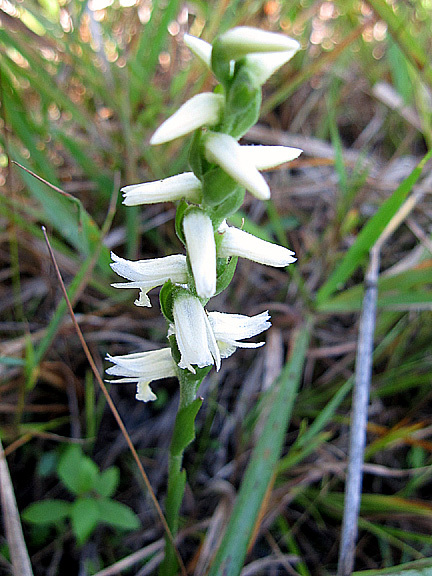 Nodding ladies'-tresses (Spiranthes cernua) is a native orchid. 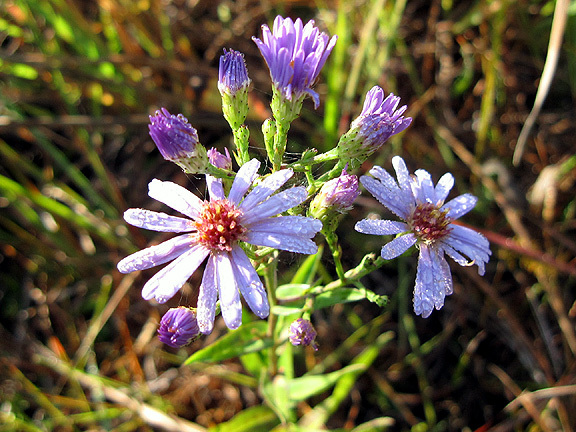 It grows only 8 to 12 inches tall, which is fairly unusual among the many taller plants in a prairie, and it's easy to miss it if you aren't specifically looking for it. It grows in consistently wet soil and prefers full sun. 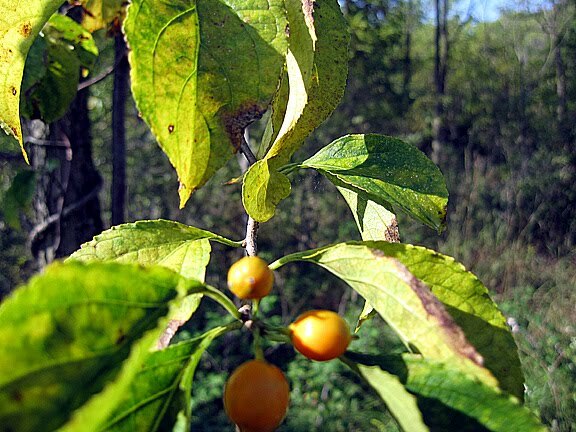 Even this bad photo of American bittersweet (Celastrus scandens) will help you ID this native woody vine in comparison to the invasive variety, oriental bittersweet (Celastrus orbiculatus). Oriental bittersweet has flowers/berries in clusters of 2-3 in the leaf axils all along the vine, whereas American bittersweet has flowers/berries in clusters of 6 or more solely at the ends of the vine. The ripe berries of both are red, but the capsules, or protective covers over the berries, are yellow for oriental bittersweet and orange/red for American bittersweet. Lol, I'm suddenly picturing myself in a booth labeled "Plant Advice, 5 Cents." Ha! Also fortunate for Shanghai Prairie is that purple loosetrife beetles (Galerucella spp.) are present. They eat the leaves of purple loosetrife and help keep the population in check. The beetle was approved by the USDA in 1992 as a biological control, after research confirmed its host specificity at numerous test sites. 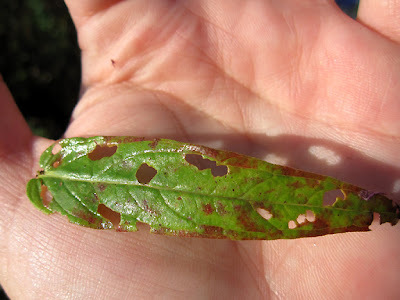 In other words, it was determined the beetles only eat purple loosestrife leaves, not those of other plants, not even other (non-invasive) loosestrifes. The beetle has been released at trial sites in Michigan since 1994. They were not released into the Shanghai Prairie, but appeared on their own from nearby sites. I can almost imagine a bunny holding one of these rabbit tobacco (Gnaphalium obtusifolium) flowers and smoking it like a cigar, except that in my mind, rabbits wouldn't smoke! The plant is sometimes also called sweet everlasting and it is supposedly fragrant (smelling like maple syrup), but I didn't bend down to smell it. 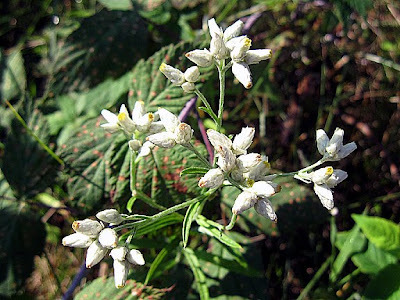 The plant gets up to two feet tall and likes dry or well-drained soil. ...the New England aster (Symphyotrichum novae-angliae). 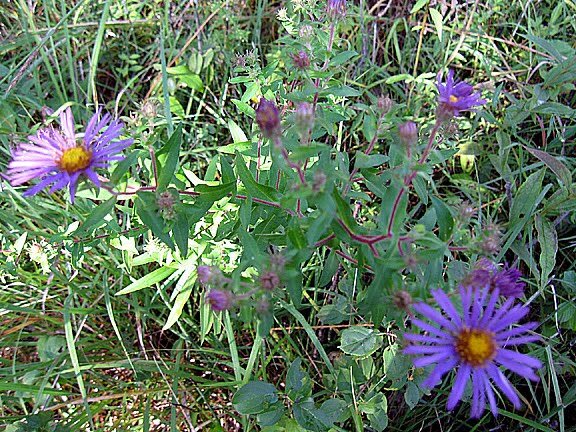 The New England aster also gets taller, to 4 feet and above, and its flowers tend to be darker purple, than smooth aster. It also prefers full sun, but can handle some shade, and seems to deal with different kinds of soils. If you have these in ornamental beds with shorter plants, and want more uniform heights, you can cut them back on July 4 the same time you cut back mums. Mine self sow here and there and I like them towering over other plants. 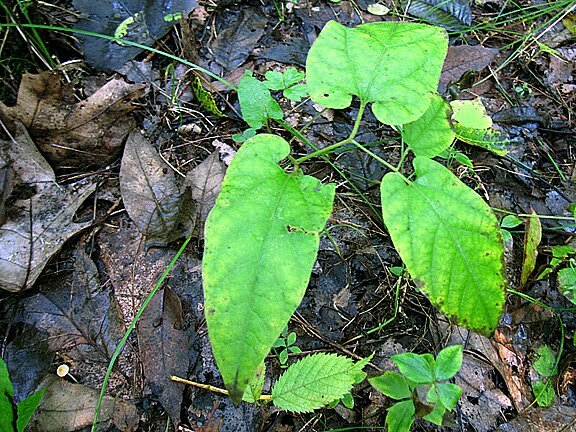 The humble-looking Virginia snakeroot (Aristolochia serpentaria) is actually a rare and threatened species in Michigan, present in only two counties. It is an indicator species of a high quality oak woods. This one was growing in the wooded hillside near Shanghai Prairie. You cannot remove threatened species from their natural locations. - Saturday, October 22, 9:00 a.m. to 1:00 p.m. Please wear long pants and sturdy closed toe shoes. To register and get directions (on campus of St. Joe Mercy Hospital), call volunteer steward Aunita Erskine at 734.668.6354 or email aunitafl at umich dot edu. Wow, you are so knowledgeable. I know very few of these plants so I really feel better reading this post and hope I will remember all these plants-especially the bittersweet. I surely cannot identify either one. The loosestrife. Well that is one I know as all my friends said never ever plant it and it is advice I've followed. Glad it is in check there. I agree with Tina... and like her, the only ones I know a little about are the Loosestrife. I too was warned never to plant it. I enjoyed the info and the tour and since I'm no longer a resident of Michigan, it will be nice for me to pop in and check your post to see what's up with plants in my former home. Yes. Have enjoyed the tour! It's odd about rabbits and smoking. In the Beatrix Potter Peter Rabbit books, they use Lavender Tobacco which seems not only odd for a rabbit but sounds pretty disgusting full stop. So much information on the Prairie and how interesting a beetle that will keep invasive plants at bay! The beauty you captured at the Ball Horticultural Co is just stunning. So much color for my eyes to enjoy today! What a wealth of plants. I love Solidago, always think they look kind of exuberant! Amazing about the purple loosestrife beetles! I certainly did enjoy my romp at prairie fen. I was so glad I popped over. I bought some ladies tresses recently from an orchid specialist. They are pretty, tku for showing. Purple loosestrife is a native in UK. I have never seen your native orchid Spiranthes before and it is so pretty. Thanks for the walk around the meadow too! I would love to stroll through the prairie with you Monica. It looks beautiful through your eyes. I could look for birds too. Very interesting & educational post. I have that Nodding Ladies Tresses and planted it in full shade. :( Now I know I need to rectify that asap! Great walk through your wildflower prairie and your detailed information including pictures. I love wildflowers. Very often they are more attractive to me than flowers grown in greenhouses. Delightful natives Monica! Asters are favorites here, just wish the bunnies didn't like them so much. I have to put little fences around our asters or the bunnies eat them to the ground. I did so enjoy my armchair romp with you, dear Monica, and so appreciate the time that went into this informative post. You are a wonderful teacher! I'm still mad about the aster overhaul. There's no way I will ever learn to pronouce the new names. Such a wealth of plants on the prairie. Nodding Ladies' Tresses grow wild here. Plant Delights says it has a vanilla fragrance but I've never been able to detect one. Lovely, looks like a great day of fall walking and hiking around. Von Präriepflanzen habe ich keine Ahnung... naja, ist wohl bei uns auch nicht das richtige Klima dafür. Im Moment regnet... naja, fast eher schneit es... bääääh. Du hast Dich nach dem Häuschen in meinem Blog erkundigt. Grins, das ist das Hasenhäuschen, welchem Noah gerne einen Besuch abstatten wollte. I don't know how I managed to miss this post when you first put it up, but I've enjoyed reading it now! So many plants that I've never heard of because they don't grow over here ...and you know so much about them! Respect Monica! Amazing photos and wonderful text. I am wild about prairies, chalk it up to Willa Cather and actually seeing the glorious diversity in prairies. What an awesome garden. I'd never seen some of the native plants you've covered here. OK, next year I'm going to have to see this in person. Seeing as you are far more knowledgeable at this kind of stuff than I am, do you know any plants and flowers that grow especially well in conservatories? Any suggestions would be a big help. glad to find you! new to the Midwest from the Pacific Northwest and I enjoyed learning from your post! Wild flowers should be encouraged more often.